Young Minds Studio Intelligent Controller provides the foundation for portable, scalable, expandable, reliable, easy-to-use, easily integrated, and easily upgradable products. All Young Minds CD and DVD recording solutions use the Studio Intelligent Controller. With the Studio Intelligent Controller as a starting point, adding different modules lets you build a solution that evolves with your production and capacity requirements. 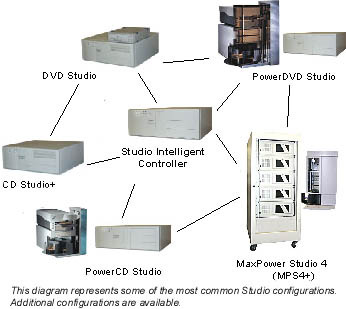 Adding an internal CD-R drive turns the Studio Controller into CD Studio+, which easily scales to become PowerCD Studio, DVD Studio, PowerDVD Studio, and the MaximumPower Studio (MPS4+, rack-mounted array of from 2 to 4 redundant, independent controllers). Upgradability and scalability are perhaps the most important benefits that derive from the Studio Intelligent Controller. Adding DVD-R and/or automated production capability to a Studio Controller requires only firmware and software upgrades. There is no need to change or install new drivers. When upgrading to automated production, Young Minds also provides an optional suite of Java-based CD-R/DVD-R workflow applications that further simplify use and system integration. The Studio Intelligent Controller minimizes some, and eliminates most, of the environmental variables that can negatively impact the CD and DVD recording process. These variables include background tasks associated with the operating system (daemons), other applications (background or foreground), system resource load, amount of free disk space, disk rotational speed, amount of disk fragmentation, integrity of the SCSI bus, and network traffic. A variance from nominal values in any one of these (and other) areas at any time during the recording process often results in producing unreadable discs. In addition to mitigating environmental concerns, the Studio Intelligent Controller provides other significant benefits, including the ability to record data residing across the network and the ability to record discs while other user tasks and applications are running. The Intelligent Controller attaches via a SCSI connection to a host computer. The host can be connected to the network, can be either a workstation or server, and can run all other tasks/functions while running the Studio Intelligent Controller. The CD-R writer, DVD-R writer, or autoloader (with writers) attaches via a dedicated SCSI connection to the Studio Intelligent Controller. The CD-R writer can be either installed in the CD Studio Intelligent Controller (internal unit) or can be external as a standalone unit. DVD-R writers must be installed externally due to thermal requirements. In automated solutions (Power Studio and MPS4), the writers are installed in a robotic disc autoloader. Host software (MakeDisc) is installed on a workstation or server. The function of this software is to prepare ("premaster") the data you will be recording on CD or DVD. The Studio Intelligent Controller and recorder do NOT have to be attached to this host; however that is the normal configuration. Network traffic is usually minimized if the Studio Intelligent Controller attaches directly to the host. The Studio Intelligent Controller uses native tape device drivers that are already built into your operating system. The type of tape device that Intelligent Controller emulates is determined by the operating system. In most cases, the Studio Intelligent Controller emulates an Exabyte 8200 tape drive.